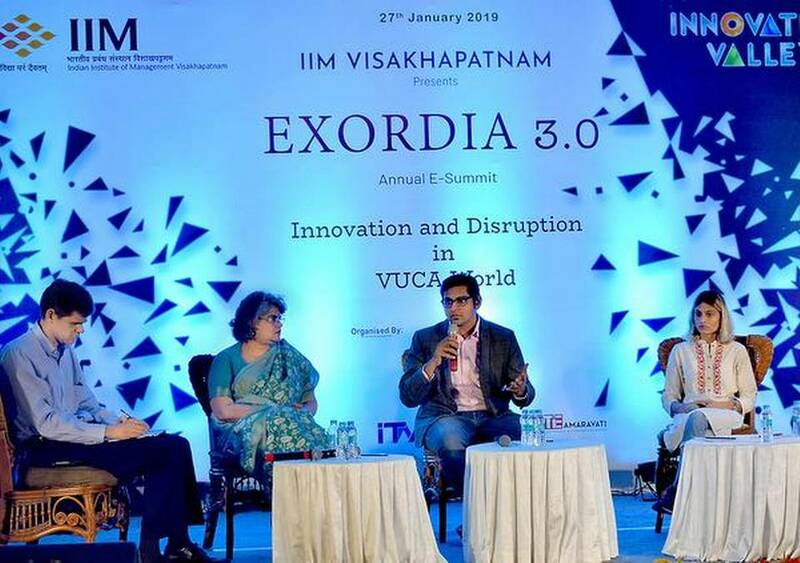 Exordia 3.0, the annual entrepreneurship summit of Indian Institute of Management (IIM)-Visakhapatnam turned into a platform for city-based startups to showcase their business models and products, here on Sunday. From water-drones to herbal cosmetics, the innovative ideas of startups found expression at the programme that was organised in association with Andhra Pradesh Innovation Society (APIS), with the theme of How to chant success mantra. Quizzich, a quizzing event with entrepreneurial passion and Innovation Club of IIM-V was the highlight of the summit. As part of the B-Plan competition, the flagship contest of Exordia, five top teams battled it out with innovative concepts. The diverse and distinct ideas proposed included Sportify, Ghar ka khana, Samriddhi (agro-based startup), Street (generating employment among poor and needy), and an Edutech startup. The participants in the event captured the attention of the audience and received some valuable insights from the judges. Exordia also provided a platform to five entrepreneurs from Visakhapatnam to showcase and speak about their ideas and increase the visibility of their firms and products. The event had an active participation from the students and corporates from the city too. Successful entrepreneurs shared their experiences on Innovation and Disruption in VUCA (volatile, uncertain, complex and ambiguous) World. The motto of the event was to reach out to budding entrepreneurs across the nation and encourage creativity and innovative ideas from students, the organisers said. In his welcome address, IIM-V Director S. Chandrasekhar emphasised the role of creativity and innovation and the role of youngsters in the ‘disrupting age’. One of the keynote speakers, Girish Bhagat, board member of India Nivesh Group & Benedict & Co. Italy, spoke about the spread of startup ecosystem across nations. POCO India GM Manmohan Chandolu discussed entrepreneurship and harped on the importance of product thinking and product servicing. IIMs can help strengthen the ecosystem of States, bringing together the synergy of innovation and entrepreneurship, APIS CEO Winny Patro said. Partner at Senia Capital, Dinesh Goel delivered speech on staying relevant in a dynamic world. He spoke about how emerging technology was shaping the new world.